1. Place all ingredients into a food processor and pulse until you have a smooth paste. 2. Scoop balls of the mixture out with an ice-cream scoop or tablespoon, smooth them by rolling in your hand, then heat 2 tbsp. olive oil in a non-stick pan, fry the falafel for 5 minutes on each side until golden brown. You can also bake the falafels by placing them onto a lined baking tray and bake for 25 minutes at 200C. 3. Place all ingredients into a large bowl and mix to combine. 4. 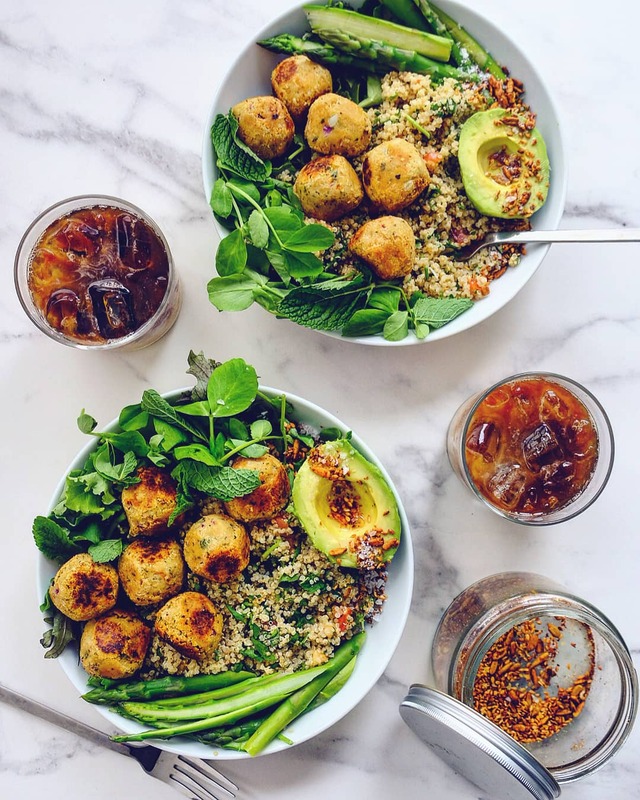 To assemble, place a handful of leafy greens into 2 serving bowls, top the greens with half of the quinoa tabbouleh and warm falafels in each bowl. Add the scooped avocado, asparagus and a drizzle of olive oil to serve.